To count your calories, you’ll need to keep track of what you eat. You need to get a kitchen food scale that weighs in grams. Kitchen scale gives you peace of mind knowing that you’re following the diet correctly. It is great for measuring baby food too – precise and accurate. For the retro lover, the vintage style kitchen scale also adds a kind of rustic old fashioned charm to your kitchen besides helping in correct meal preparations. In fact, the classic old school kitchen scale looks lovely on your kitchen counter top. Retro vintage food scales do not come with fancy features unlike the modern digital food scales. But what is important is that as kitchen weighing scales, they work. Retro style kitchen scales normally come with a bowl and a scale with a large round analog face that is calibrated in oz and/or grams. I remember seeing a lot of these vintage style traditional weighing scales used in restaurants as well as farmers markets and these are surprisingly accurate even though not digital. Add a bright splash of color and a chic retro look to your kitchen with this beautiful sturdy steel construction and vivid red-enameled body vintage inspired kitchen scale. It has a pear-shaped, stainless steel bowl that is designed for easy pouring. It has a large easy to read dial face. This lovely retro kitchen food scale measures 10.2W x 11H x 8.85D Inches. It can weigh up to 4 pounds or 2 kg. This 11 pound or 5 kg retro style kitchen scale measures in 1 oz increment, perfect for weight watchers. You can measure in oz or grams. The weighing bowl and body is made of stainless steel. There is an adjustment knob at the base of the unit for you to calibrate the scale. The dial is 5″ in diameter and has great contrast colors of black, white and red. Cleaning up is easy as the bowl is dishwasher safe. No batteries or electric power is needed for it to work. The stainless steel body of this vintage style kitchen scale looks as professional as those used by gourmet chefs. I think it adds a touch of professionalism to your home kitchen. You can get it in stainless steel or cream color. The stainless steel bowl sits securely on the body supported by stainless steel upturned braces. Calibrated in oz and grams, you can weigh up to a maximum of 8 pounds. The large round face, big easy to read numbers and eye-catching red needle ensure no mistakes are made regarding your measurements. This retro kitchen scale comes with a calibration knob just under the bowl that you can manually adjust to the zero position. The removable metal bowl is easy to clean. No batteries needed would be considered a plus point. This home kitchen scale can measure up to 44 pounds or 20 kg. with 2 oz increments. This is great for measuring larger portions of food. However, it is not calibrated for trade use. This is great for hunters who need to weigh their meat for making sausages etc. It is also great for weighing your produce for canning. The scale measures 0.5″ L x 10.5″ W x 12.5″ H. The removable bowl has a 10″ diameter. This beautiful retro copper kitchen scale can measure up to 2 pounds. It is made of metal with a copper finish. 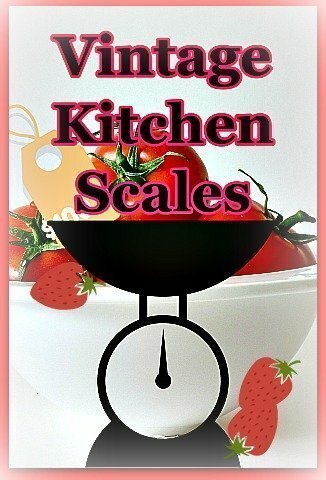 These cute looking retro kitchen scales are available in red and white colors. Made of metal and plastic, the package comes in a set of 2 food scales. Each scale measures 3.37″W x 3.37″L x 4.75″H. This vintage kitchen weighing scale comes with a stainless steel body as well as a removable stainless steel bowl. It can weigh up to 11 pounds with 1 oz graduation. Its high quality glass face and easy to read numbers make this a user friendly home kitchen scale. My aunt has one of this old school food scale which she uses to weigh her baking ingredients. Functional with a retro touch, it does look nostalgic sitting on her kitchen top. Long Ago Share Copyright © 2019.